We are delighted to present a second show of the fabulous “Destination Anywhere”. Incredible voices singing pop acapella - What a journey. 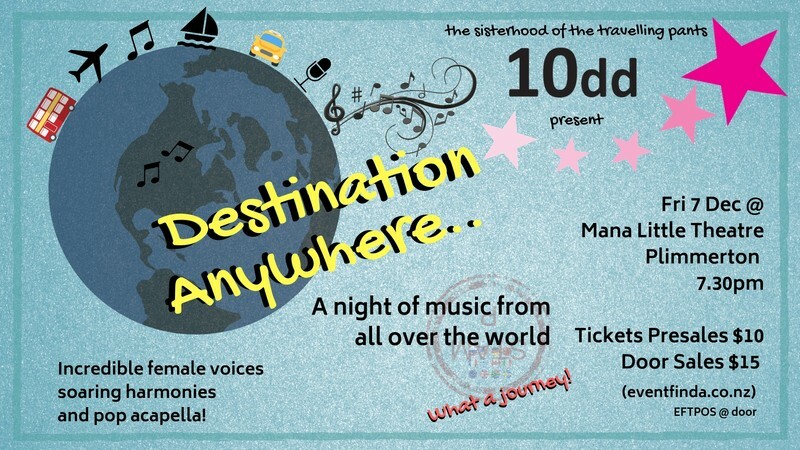 10dd - showing off as "The Sisterhood of the Traveling Pants" bring you songs from all around the world. You know how we work right people!? Hmmm - Songs from around the world... Oooo - let's rearrange/derange Don't Cry For Me Argentina! Oooo - Land Down under... Walk like an Egyptian. We’ll deliver them to you with humour, and no reverence at all... not true, just a little reverence. Come along for a rollicking trip around the world, carried on a tide of acapella pop. Think Barden Bella’s meet Feisty Chickens.